Setting goals is the easy part. I love a good goal. I’m all about goals. In fact, I used to make goal posters and jot down when a goal had been achieved. Setting goals can be fun and, most of the time, coming up with a goal is the easy part. Reaching a goal is where it starts to get tricky. Everyone has heard the expression, “The road to hell is paved with good intentions.” That’s kind of how I feel when I set a goal. But when reality sets in and it’s time to start or reach that goal, it can be a little overwhelming. I’ve learned on the “road to hell” that setting a goal should be simple and fairly easy to achieve. Something like, oh I don’t know, blogging everyday for 25 days may be a bit extreme. Like I said before, a goal should be something that you can see through, from beginning to end. I was asked in a job interview this week to give an example of a goal that I set for myself and was able to complete. Sadly, in my 36 years of life, I could only think of one example. The goals I tend to set for myself seem to be a somewhat overwhelming. Too good to be true, even. Let this be a lesson to me. 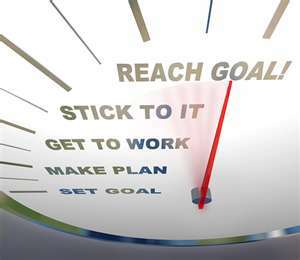 A goal worth setting should be a goal worth completing. If I think, even for a moment, that it might be too big, it probably is. It should be something that can be achieved a day, a week, or a month at a time. Set your eyes on the prize, just make sure it’s something you can see.